We’re at midcourt, and the ball is about to go up…it’s Monday Tip-Off! Start your week here at the NLSC with a feature that’s dedicated to opinions, commentary, and other fun stuff related to NBA Live, NBA 2K, and other basketball video games. This week, I’m tipping things off with a breakdown of the in-universe value of Virtual Currency in The Neighborhood in NBA 2K18. Yes, I’m writing about Virtual Currency and NBA 2K18 again. I guess I’m a hater, a biased NBA Live fanboy looking to bash 2K at every turn. According to at least one disgruntled former reader, that’s exactly what I am. Or maybe, just maybe, I’m simply a dissatisfied consumer who believes that all of us who play NBA 2K18 deserve to be treated more fairly. Whether it’s NBA 2K, NBA Live, NBA Playgrounds, or any other game that we play, we do ourselves a disservice by not speaking up when there are issues. There’s no guarantee that we’ll get the result we want, but if we don’t speak up, we can pretty much guarantee that we won’t see the changes we desire. Frankly, I’m still talking about Virtual Currency because it’s an on-going issue. After dropping the prices of hairstyles, facial hair, and hair colours in an early patch, Visual Concepts haven’t made further adjustments to VC earnings and in-game prices. Well, that’s not entirely true. 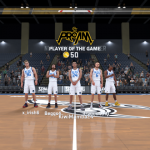 They’ve reduced the reward for Player of the Half and Player of the Game in 2K Pro-Am. What they haven’t done is increase the VC rewards, bring back the difficulty multiplier, or reduce the prices of clothing and consumables. This is particularly infuriating when you consider the actual in-universe value of Virtual Currency. Thanks to our MyPLAYER card, that’s something we can easily figure out. Of course, you don’t even need to make the conversion to in-universe dollars to know that there’s something very off about the prices in The Neighborhood. 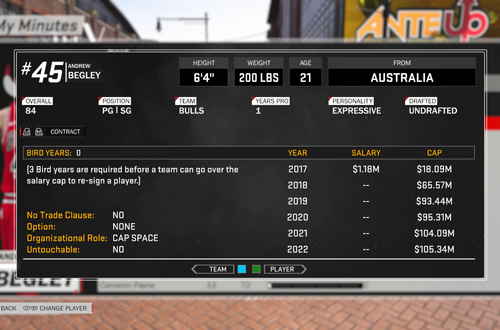 As a rookie, your per game salary is 500 VC. The cheapest plain t-shirt in Swag’s is 600 VC; a pair of basketball shorts will set you back the same amount. 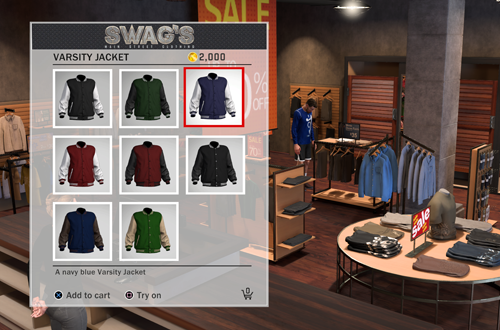 Hoodies and jackets can cost as much as 2000 VC. 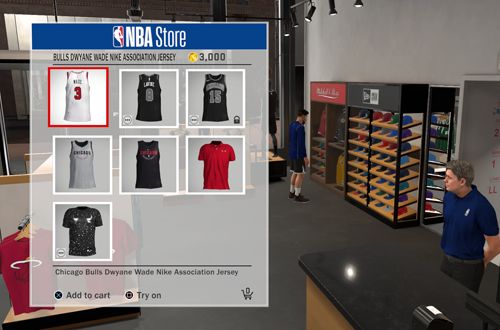 Premium clothing, shoes, and NBA apparel generally have price tags of at least 3000 VC, with some items admittedly being a little cheaper (though usually still in the 1500-2000 VC range). In other words, one item of clothing can cost more than one game’s salary. Indeed, it can cost more than a whole week’s salary! As I noted above, since we do actually know what our rookie salary is in dollars, we can determine the in-universe value of Virtual Currency. As an undrafted rookie who made it to the big time on the back of our performance in a streetball tournament, we’re understandably not earning the big bucks just yet. Our rookie salary is $1.18 million. Divide that figure by 82 games, and we can determine that our salary is around $14,390 per game. The 500 VC we earn per game (not including the bonuses for stats, endorsements, and teammate grade), therefore roughly equals $14,390. We can thus also work out that 1 VC equals $28.80 (let’s call it an even $29). Placing an in-universe dollar amount on Virtual Currency makes the prices of just about everything seem absolutely ridiculous. Referring back to some of the items I mentioned before, let’s consider a few examples. A basic t-shirt or pair of basketball shorts? Rounding up 1 VC to an even $29, they carry price tags of $17,400. Now, I know that some NBA players have expensive tastes, but picking up a shirt and some shorts is unlikely to set them back over $30,000! Take a glance at the online NBA Store, and you won’t see any authentic jerseys on sale for $87,000. Basketball shoes are notoriously expensive, but a new pair of Air Jordans doesn’t cost $100,000. While those prices are ridiculous, the cost of accessories is even worse. Headbands cost 1000 VC ($29,000), while sleeves, bands, and the like are 300 VC ($8700) across the board. Not only are those insane prices for items such as sweatbands and braces, but they’re generally amenities that NBA teams will provide for their players; we shouldn’t even have to purchase them in the first place! Gear purchased for use in The Playground and even 2K Pro-Am is arguably a different matter, though it shouldn’t cost an arm and a leg to buy accessories to adorn our arms and legs. On the same note, very few basic haircuts are going to set you back $2900. These conversions of Virtual Currency to in-universe dollars are significant to note. After all, as I mentioned in a previous article, there are quite a few apologists who are sneering at the complaints about VC. They pose the question of whether people get free haircuts (or can try them on beforehand), or whether they get free clothes, smugly asking “Don’t you want realism?” The argument of realism falters somewhat when you take into account the absurd in-universe prices compared to our salary, not to mention the concept of players having to go to the NBA Store to buy accessories. Consider also that athletes and celebrities tend to receive a lot of stuff for free. Some of the endorsement opportunities also require you to purchase a t-shirt to wear while in The Neighborhood. Again, if it’s realism we’re striving for, any company looking to sponsor a player and use them as a walking billboard is going to provide them with the apparel they want them to wear. They’re not going to insist that they go down to the local clothes store and drop over $7200 (249 VC) on a single branded t-shirt. When you consider that this is basically what’s happening, on top of the ridiculous in-universe prices, it’s laughable to dismiss complaints about Virtual Currency with smug talk about supposed “realism”. It’s already out the window. The fact that Virtual Currency is also used to upgrade player attributes makes the situation even worse. We’re forced to choose between cosmetic items – again, a couple of which are necessary to complete endorsement deals – and improving our player, with upgrades also being rather expensive. In other words, in-universe, we may have to choose between buying a plain white cotton t-shirt, or working on our jumpshot! The slow grind to improve, and the necessity to upgrade quickly if you’re playing online, naturally encourages microtransactions. Using terminology such as “shopping cart”, and even the name Virtual Currency itself, subtly has that effect as well. You may have noticed a couple of other ways that NBA 2K18 encourages you to spend Virtual Currency, and potentially real currency, when you really shouldn’t have to. By going to the Gatorade gym, you can acquire energy boosts that deplete with every game. The problem is that they’re also depleted in online games, which means you need to interrupt a session to run to the gym and work out to get another boost. Alternatively, for a cool 500 VC, you can buy a protein bar or bottle of Gatorade for some instant energy. That’s right! A single protein bar or bottle of Gatorade costs a single game’s salary, which as we know is $14,390 in-universe. Even if you completely avoid microtransactions, you’re stuck with a tough grind due to the discrepancy between the in-universe and meta value of Virtual Currency. With the amount of backlash the game has received, this is something that Visual Concepts must keep in mind when they’re implementing Virtual Currency in NBA 2K19. However, they really should be doing more right now. NBA 2K18 has been out for nearly two months, and as I said, we’ve only seen one token reduction to the cost of hairstyles, hair colours, and facial hair. 2K has been quick to patch VC exploits and nerf earnings, but they haven’t seen fit to price items more fairly and realistically. That’s why I’m still talking about Virtual Currency. Loyal NBA 2K gamers have been the victims of an approach that is greedy and lacking in goodwill. Apologists point at NBA Live 18’s flaws, but they’re irrelevant to valid criticism of issue in NBA 2K18. They mention realism, but there are clearly many unrealistic aspects about the in-universe prices in The Neighborhood. $29,000 for a team headband. $17,400 for a plain t-shirt. $87,000 for some NBA apparel…and that’s only after you’ve levelled up to be able to buy it in the first place! At least if you get a custom t-shirt design voted in, you get it for free. Otherwise, it’s 3500 VC, or $101,500. It’s worth doing the maths, and figuring out the in-universe value of Virtual Currency. It highlights just how bad the situation is this year, and how things must change; not just next year in NBA 2K19, but through making adjustments in NBA 2K18, too. Sure, we can abstain from microtransactions, but not everyone will. If you want to remain competitive with the people who bought a head start, the incentive is there. You can also abstain from buying clothes and styling your player, but that’s obviously part of the whole experience and RPG aspect of The Neighborhood and MyCAREER. As long as we only have one currency, we need to be able to ration it more easily. Prices of clothing and consumables need to be in proportion to our salary, and ideally, better reflect real world value (especially if we’re going to talk “realism”). Frankly, gear for NBA games should be free. VC rewards in 2K Pro-Am and The Playground could stand to be higher. The difficulty multiplier should be brought back; it never should’ve been taken out in the first place. Online games shouldn’t deplete the boost that you gain through working out, and we shouldn’t have to choose between interrupting a gaming session and wasting Virtual Currency on grossly overpriced consumables to get it back. Again, it’s 500 VC ($14,390) for a protein bar. No thanks. I’ll admit to being slightly pessimistic here. NBA 2K dominates the market. They garner high scores from professional reviews. A lot of gamers will defend their practices regarding Virtual Currency with a myriad of excuses that are, to be blunt, myopic. Still, the backlash has been very vocal. A few reviewers have called out 2K on the VC gouging, which I applaud. Hopefully, there will be a change in direction in NBA 2K19, but 2K needs to start making amends now. They need to fix the in-game economy, and in all honesty, they needed to do it a month ago. Whether or not they actually do address the issue remains the $14,390/500 VC per game question. Thanks for reading! Microtransactions definitely have become more commonplace in AAA games, along with season passes and DLC. To that end, it’s how a developer handles them that matters in today’s marketplace, and 2K definitely pushed their luck this year.